This is the fourth batch of church visits that I’ve blogged about. You can read about 1-10, 11-20 and 21-30 as well. Here is the track for the ride to this chapel. 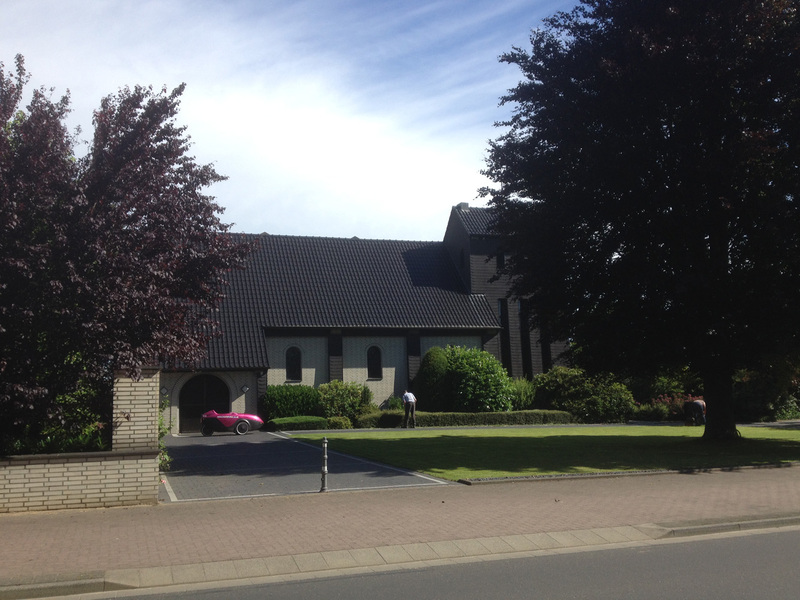 I hadn’t originally identified this as a church on my Google Map but I was cycling down Grasheider Strasse and spotted a cross on the roof of an interesting-looking building. 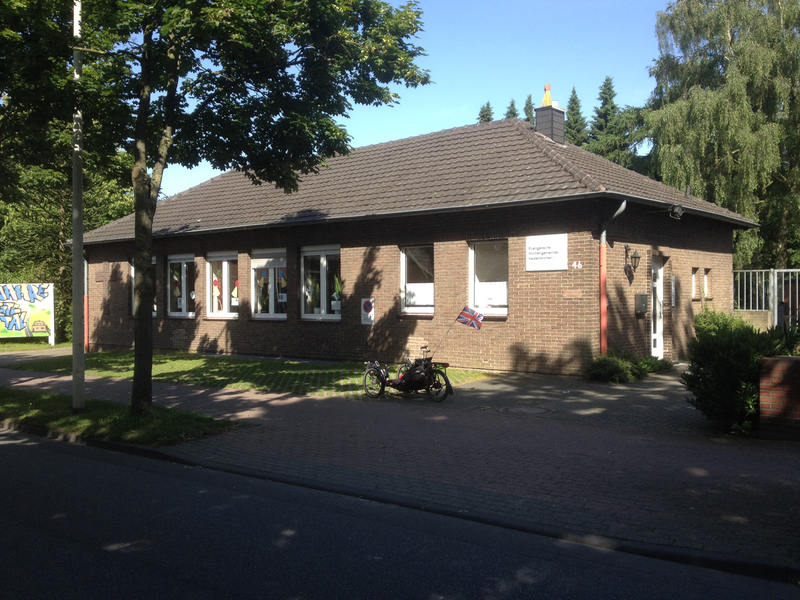 It appears to be a chapel built into an old people’s home for retired nuns from the Schwestern Unserer Lieben Frau order. The building was constructed in 2003 so is still pretty new – there were people going in and out of the door when I cycled past. Apparently it has a cafeteria for general visitors. 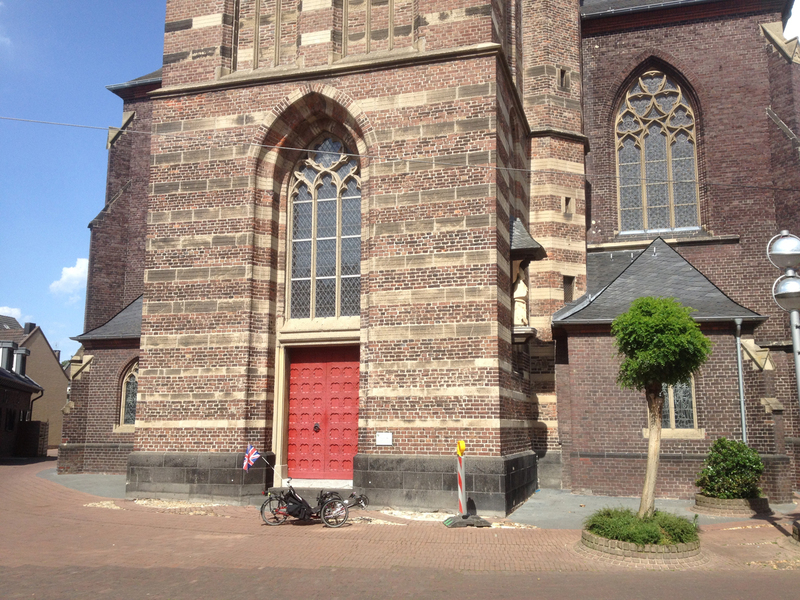 I visited this church when following a track provided to me by trike rider Klaus who regularly cycles past this church. 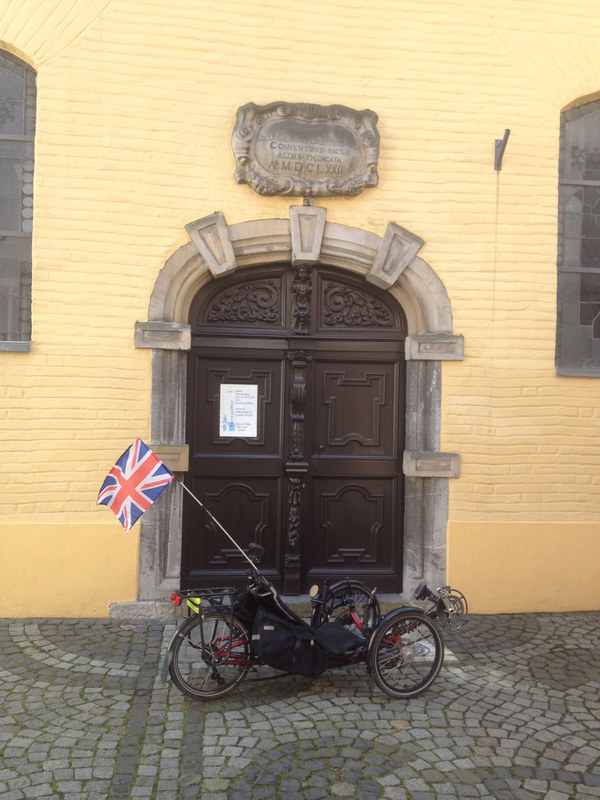 I enjoyed following the route that someone else had prepared and got a chance to visit several new churches too. As you approach Viersen-Rahser from Süchteln the square tower of St Notburga is a very obvious landmark on the horizon – and it is also visible from quite a long way to the east after I continued on. It was a very large church which felt rather heavy and dark when up close. This church was built in 1928-1929 with a few later additions. It’s a pretty impressive sight amongst an otherwise fairly quiet village attached to the north of Viersen proper. 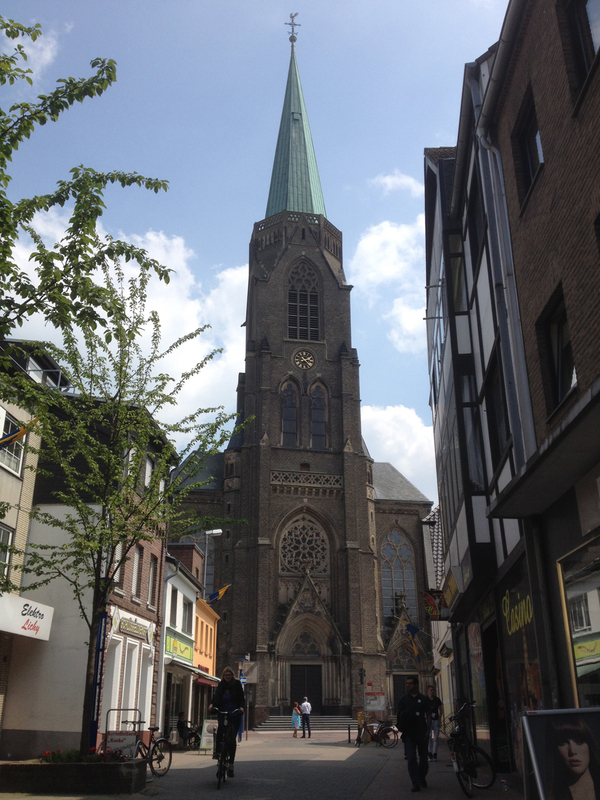 In the past we have had two churches in Viersen Rahser. One was at the Oberrahserstrasse but this church closed and ended up in an office building. 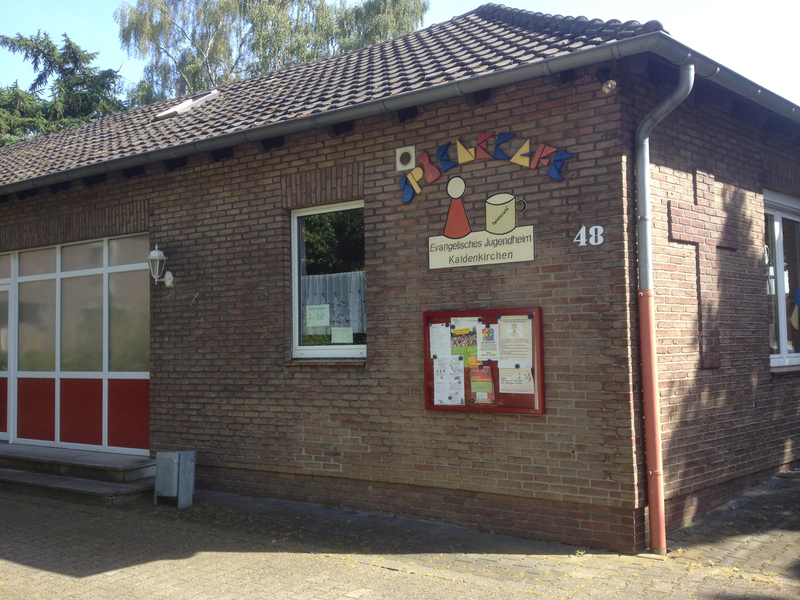 A Kindergarten belongs to that church and you will find the sign in front of the building. The second church is the Notburga Church. It is a big one compared to the size of Viersen-Rahser but it is still in use. This explained why I couldn’t find a church anywhere near the second waypoint I had in Rahser. After visiting St Notburga I felt hungry but couldn’t find a suitable-looking café so decided to ride on and detour into Anrath. It was easy to see the spire of the Catholic church as I approached across some fields but as I whizzed down one of the main roads into the town I saw this rather lovely little church. 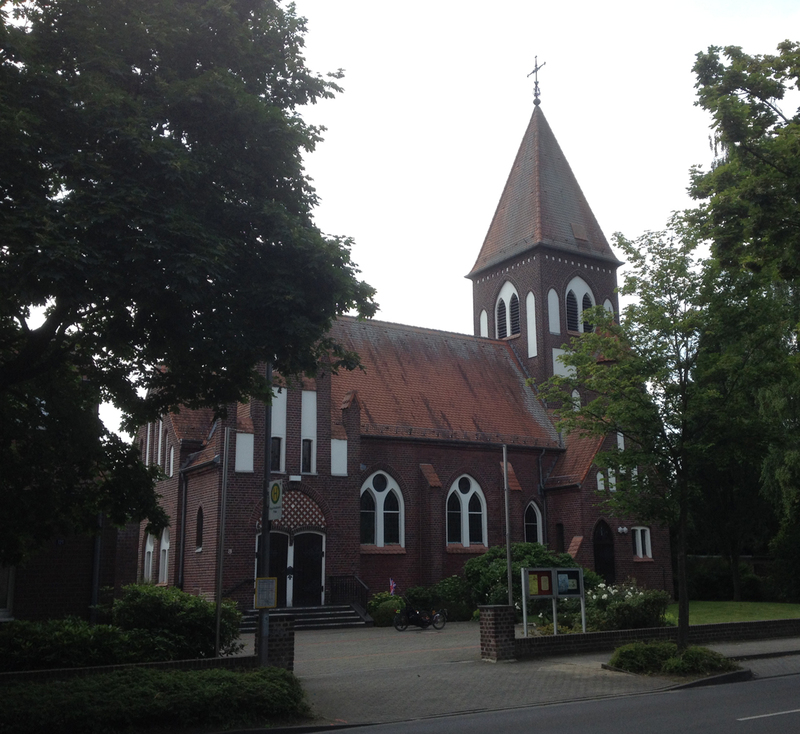 I had finally found a protestant church in this part of the Germany that I liked the look of!! 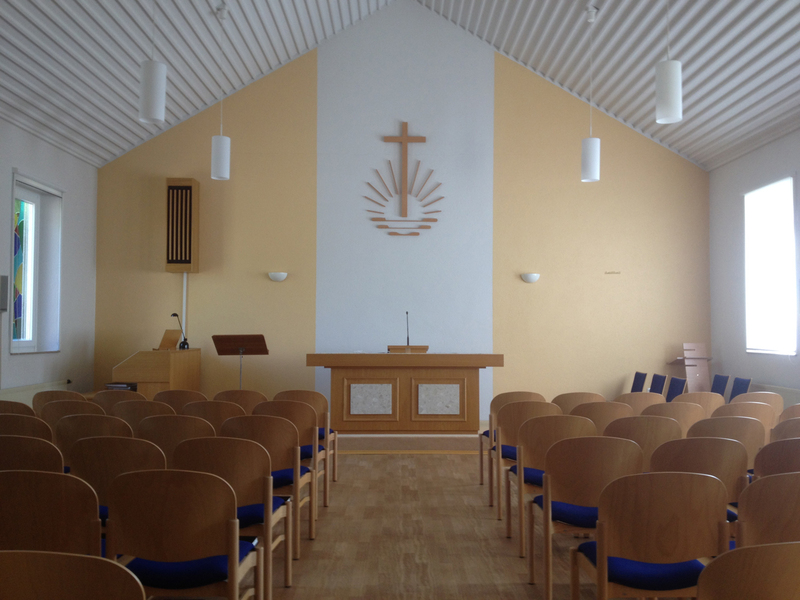 What’s interesting is that in other areas of Germany the churches are the other way round (the protestants have the old churches and the catholics the new), as was confirmed by one of my blog readers Gerhard who sent me photos of the churches in his area. Quite a different generally visual effect than the ones around here – much less use of white concrete!! This church was built in 1910 but I was unable to find out any other information about it. I would have liked to see inside as it seemed so pretty outside but there was no-one at home! 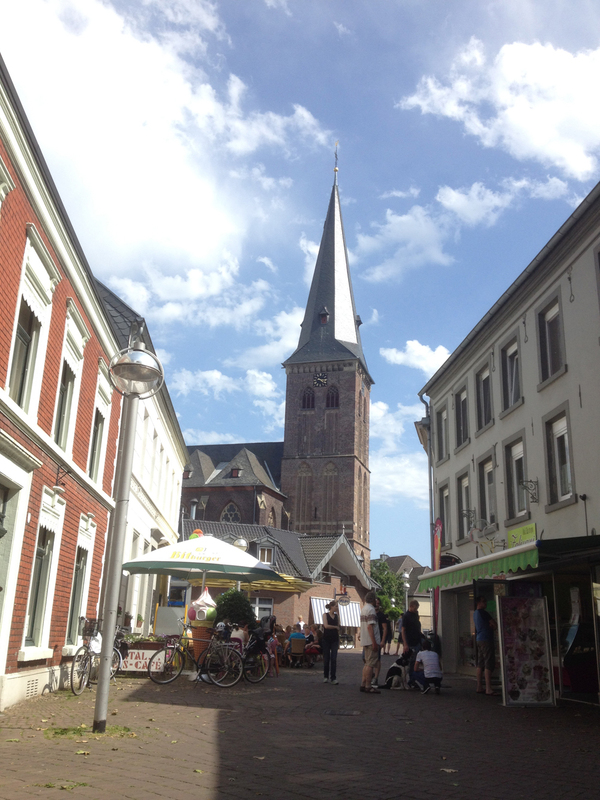 Anrath is dominated by the Pfarrkirche St Johannes, around which I regularly cycle on my way to choir practices in Neersen. Here is the photograph that I took. There happens to be a rather good bakery right opposite the church (as well as several others) so I think Anrath will become a regular stopping point. Anyway, this church was built in 1898 in the popular Gothic Revival style. There had previously been a Romanesque-Gothic church from 1740 on the site but very little was preserved when the new building was started. In World War 2 the pressure waves from bombs destroyed the historic glazing in the nave of the church and new windows were added in 1956. 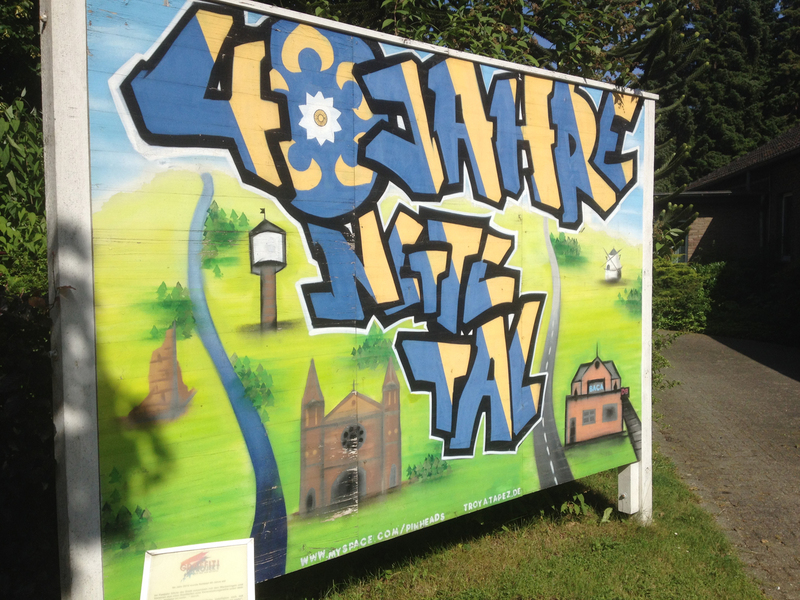 And, as an aside, ‘Süchteln’ the place name is something I have real trouble saying; it’s an entirely un-English-sounding word. So maybe I will have to ride up the heights (a moraine) sometime to see if that improves my pronunciation! The day after I visited Viersen-Rahser and Anrath with Alfie I decided to do the same 52km round trip again, this time in Penelope, to compare my speeds. Obviously I didn’t bother visiting the churches in Rahser and Anrath again, instead I detoured to Süchteln to visit a couple there. (for general information, my average speed on Alfie was 18km/h for the 52km and in Penelope was 20.5km/h, so that’s how much faster I am in the velomobile). 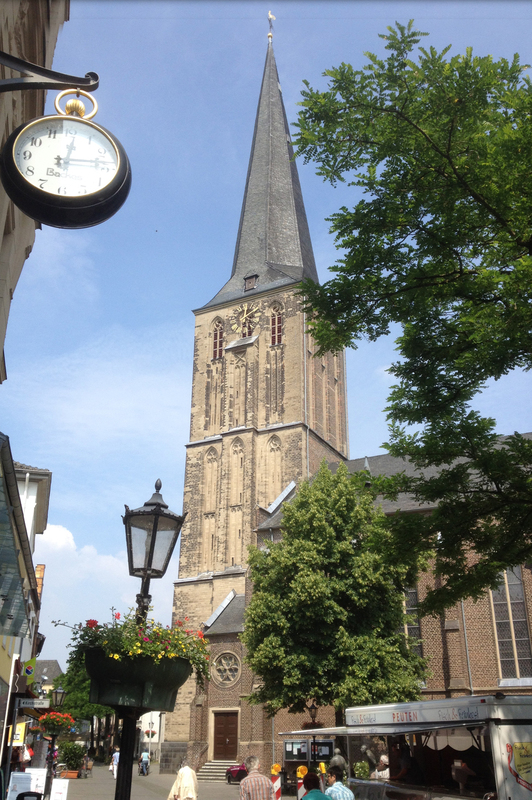 Once again the main church of Süchteln (there’s that unpronounceable word again! 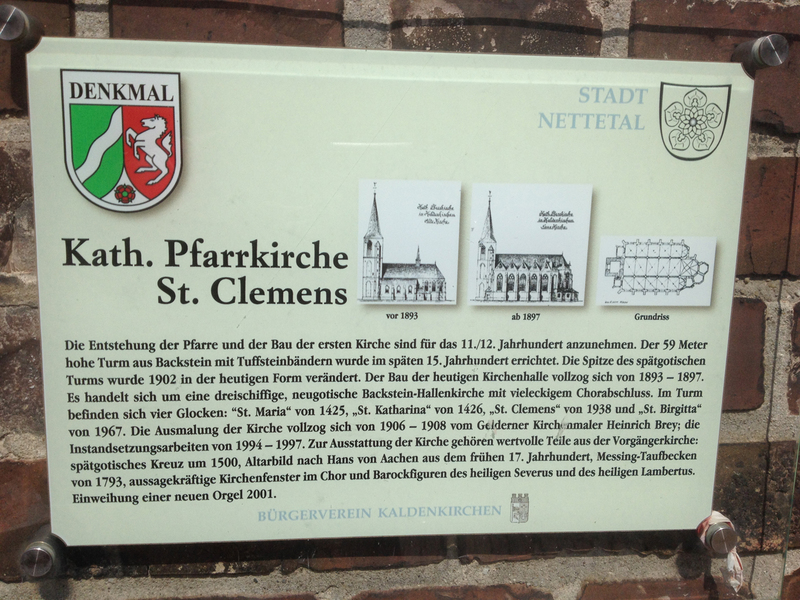 ), St Clemens, is what you see when approaching the village from all angles. The church was built in 1481 and has a well preserved tower of 73 metres tall. It proved extremely difficult to get a photograph with the whole church in – but you can just see Penelope at the bottom. After taking some photos I stopped for a cake at a rather nice café. 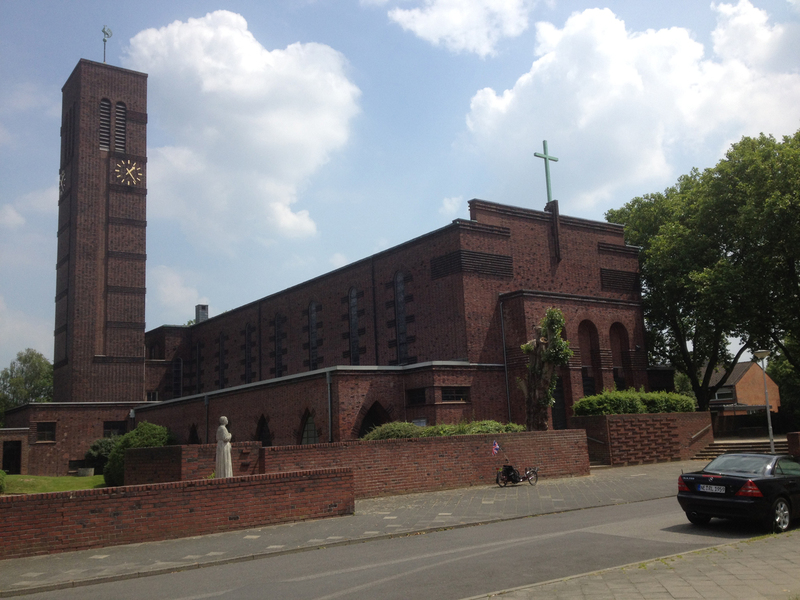 This church was on my Garmin as a waypoint called ‘Evangelische Stadtkirche’ so it sounded pretty important. However I couldn’t quite see where it was and cycled around the general area without finding anything. Then I saw a lady who had been eating in the café where I had my cake and seemed to know a lot of passers-by at the time; she was clearly a local. So I asked her where the church was and she said “We only have one church in Süchteln, the Catholic Church.” This seemed odd but no doubt she knew. I set off down the only road in the general area I hadn’t ridden along yet and lo and behold saw a noticeboard for the Evangelische Kirchengemeinde. And there was the church! It was rather tricky to get the whole church in without the sun making the photo too washed out. I didn’t really succeed but here is Penelope outside the church! A bit of subsequent Googling suggests this building is called Katharina von Bora-Haus (Katharina was the wife of Martin Luther) and there’s another building that belongs to the Evangelical Church as well. I will have to make another visit! http://www.stclemens-kaldenkirchen.de/ – a very colourful website! 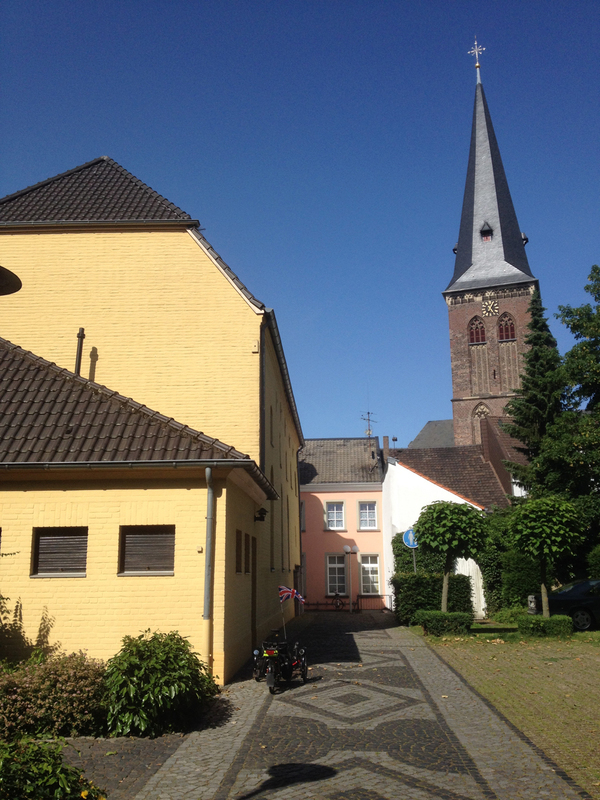 I visited two churches in Kaldenkirchen and one in Lobberich on a hot afternoon’s ride on Alfie – hoping that the fresh air outside on the bike would be a bit cooler than staying inside the house. It sort-of worked. 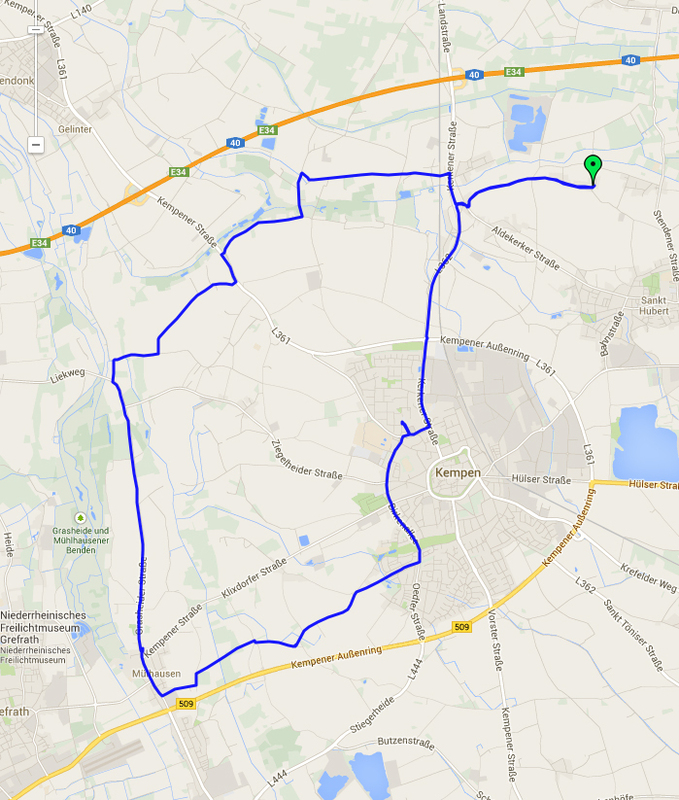 This was my route to Kaldenkirchen and then Lobberich, with a scenic detour to avoid Kempen on the way back. St Clemens was the church right in the centre, of course, so I headed for that navigating by sight (you could see the spire most of the time). I had been to Kaldenkirchen before and enjoyed a waffle at the Eiscafé beside the church so I did the same (except they had run out of waffle mix so I had to have an ice cream). It had this useful plaque with historical information. There have been several churches on this site since around 1450. This one was built in the late 1890s. The website for the church shows that there’s loads going on and it seems a pretty lively and active place. 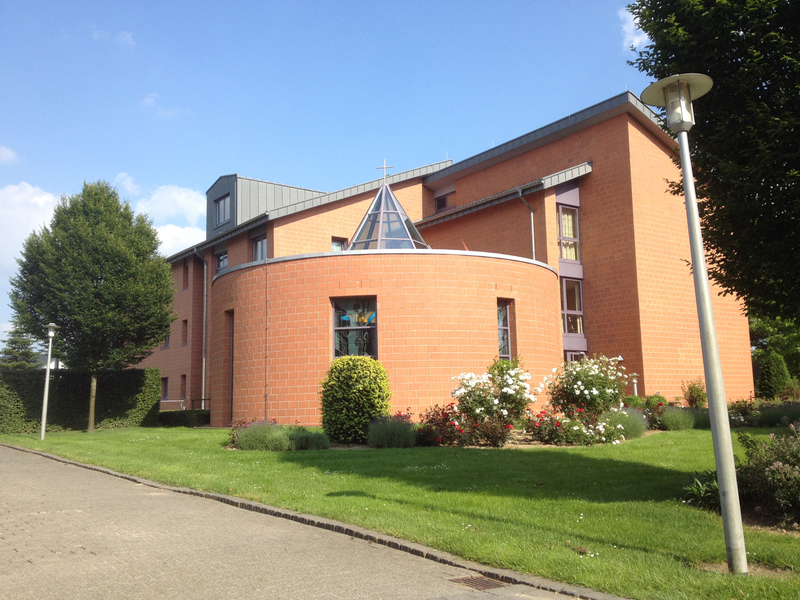 This is the Gemeindebüro (the office), not the actual church, as I soon realised. I have given both addresses above. I kinda wanted this to count as two churches in my visiting but it doesn’t really so it’s all just number 38! The Gemindebüro, this building, was also the young people’s hall and they had lots of stuff going on, including this graffiti placard. The games hall for kids. Having seen the website for this church, they are also pretty busy with stuff going on. Clearly Kaldenkirchen is less moribund than many towns with regard to churches! I needed to find the actual church so I looked on my Garmin map’s Points of Interest and it had the church so I followed the Garmin’s route and ended up pretty much round the corner from St Clemens. 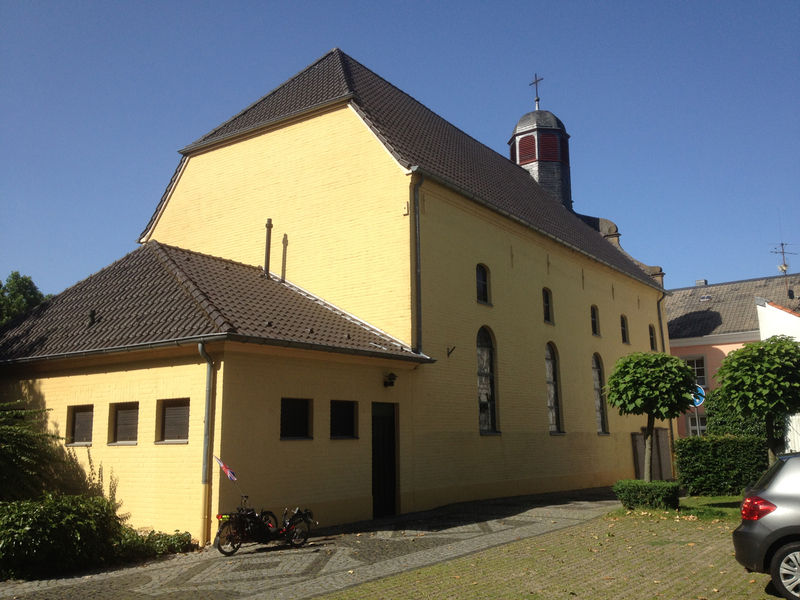 This church was painted an unusual yellow, but I liked it – it looked very cheerful! 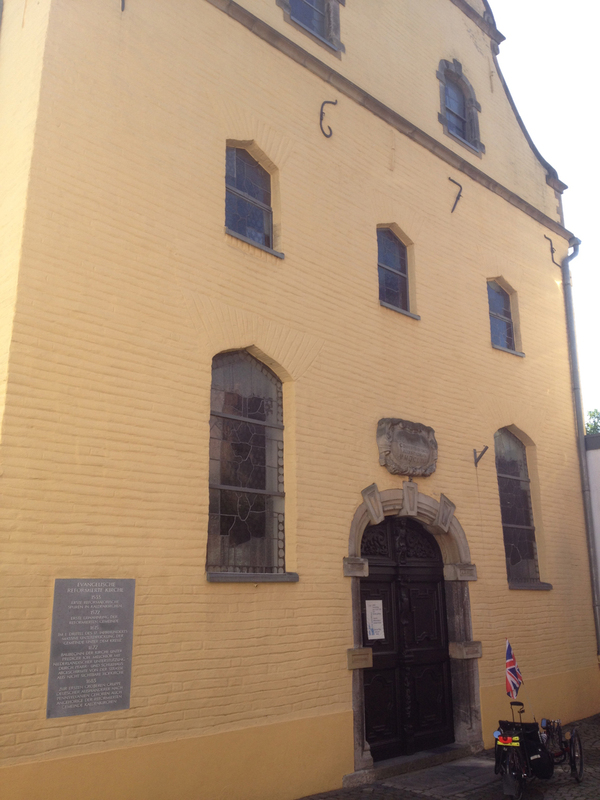 The church was first built in 1672 but lots of renovations, cleaning and other improvements have been necessary over its lifetime. It was difficult to see the front façade as there were other buildings far too close – my back is against the wall of a building to take this photo. 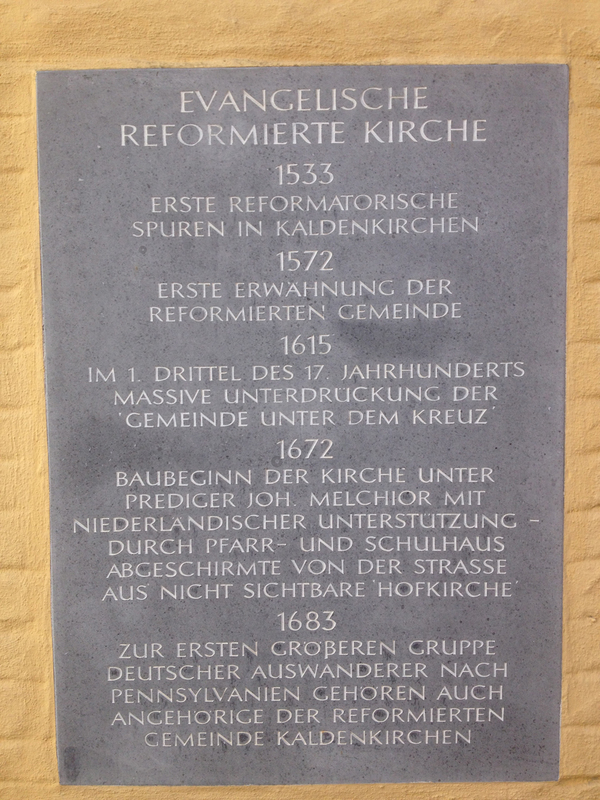 A helpful plaque giving the history of the Evangelical church in Kaldenkirchen – and the info that some people left from here to the colonies in Pennsylvania in 1683. As I headed back from Kaldenkirchen I passed through Lobberich and decided to divert to visit the nearest church, which happened to be another NAK (Neuapostoliche Kirche). 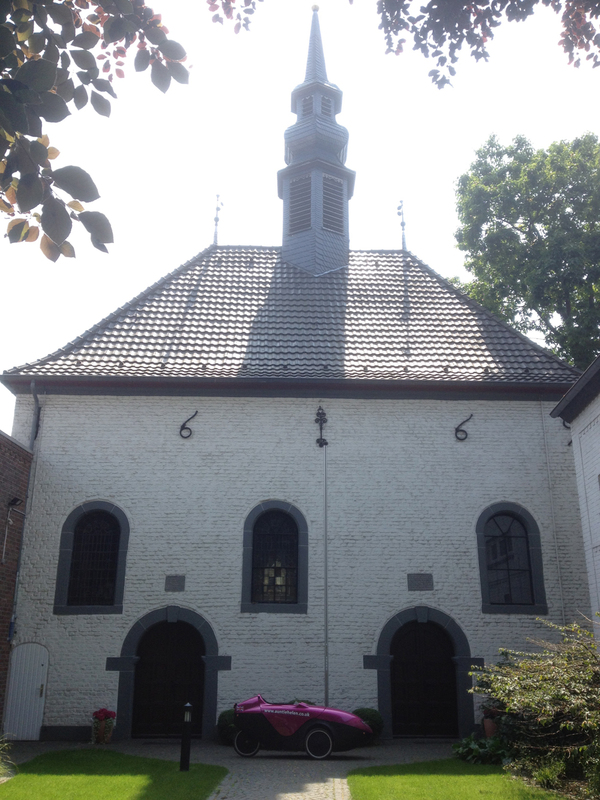 I have visited the NAK church in Kempen already and written a little bit about it – many say that the NAK are a cult. I don’t know about that, but I was fortunate to bump into a couple of people coming out from the church. The lady had been taking away the old flowers and let me in to have a look at their main sanctuary. She said I could take a photo. 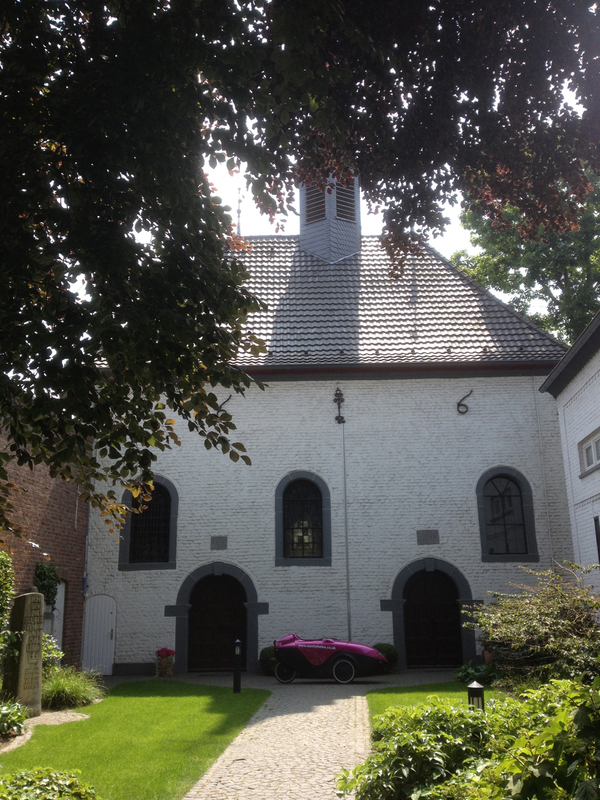 I visited this church as part of a ride to Brüggen to meet fellow velomobile rider Oliver. This church was about 100 metres off my planned route so I thought it worth a visit – and it was! You can see a chap cutting the hedge in the photos – when I arrived a couple were working on the gardens, with the lady mowing the lawn. The whole place was beautifully tended and there were some picnic benches at the corner of the plot. It was clearly lovingly cared for. 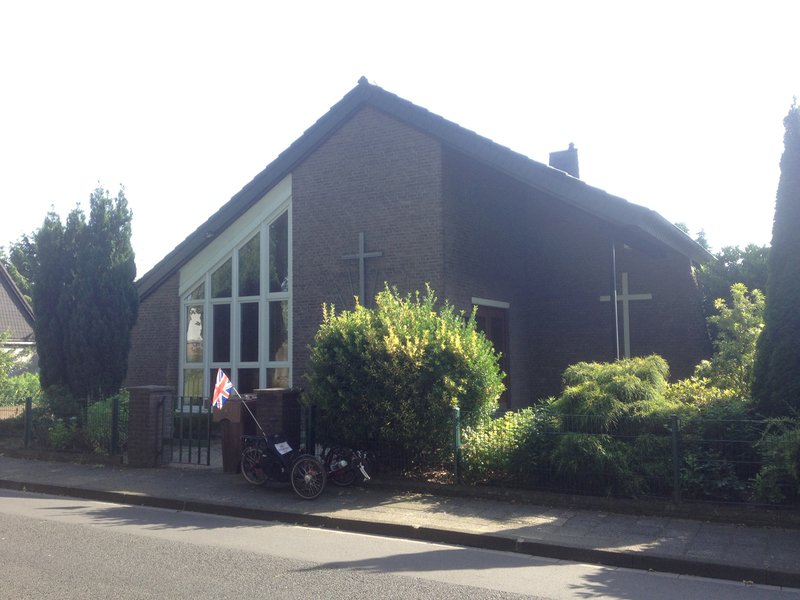 I chatted to the lady mowing the lawn and she said the church had celebrated its sixtieth anniversary a few years ago (as described in the newspaper article linked to above). 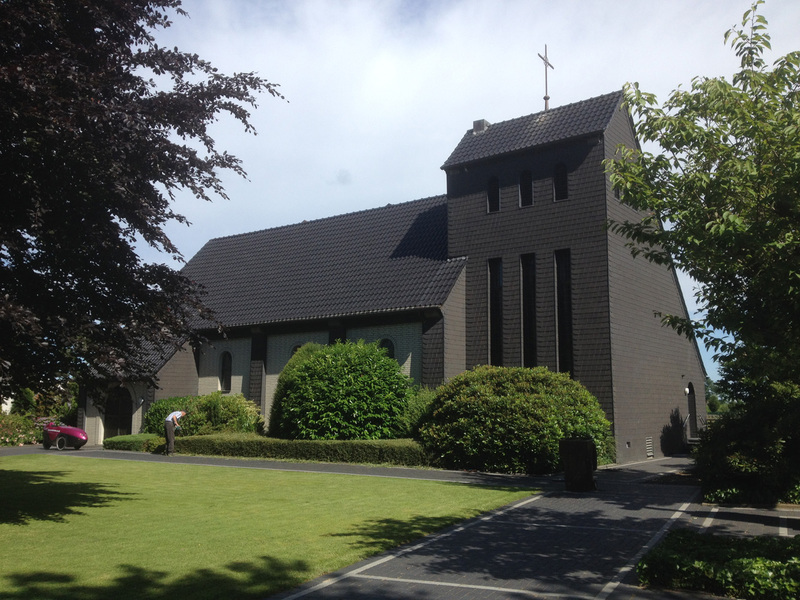 It wasn’t built as a replacement for a church damaged in the war but was newly built in 1951 with space for 200 people, although the lady lamented that not very many people came any longer. It was a rather lovely building, though, and the lady said she would have loved to show me inside but they didn’t have the keys with them today. Here’s the map of all 40 churches visited so far.